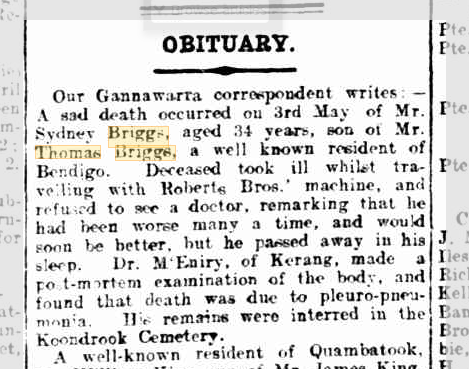 While I was searching for articles about Thomas Briggs for today’s Trove Tuesday post, I found a death notice, that created a bit of a puzzle. “Australia, Victoria, Inquest Deposition Files, 1840-1925,” database with images, FamilySearch (https://familysearch.org/ark:/61903/1:1:Q24H-TFZD : accessed 10 January 2017), Sydney Briggs, 04 May 1916; citing Probate, Gannawarra, Victoria, Australia, Public Record Office of Victoria, North Melbourne; FHL microfilm. This made not finding a death entry for him even stranger. The obituary stated he was buried at Koondrook Cemetery, and the inquest file mentioned Koondrook police, so I tried searching for a death in 1916, using first in the Place field Koon*, and when no entries came up, I then tried *rook, and found an entry for Wm Briggs, father Wm Briggs, mother Unknown, place of death Krook, age 35, registration number 6515. I decided to get the death certificate, to see if the information on the certificate would help me determine if he was the son of Thomas Briggs and Elizabeth Sharp. Cause of death: pneumonia Verdict returned at Inquiry held by James Watson JP at Gannawarre on 4th May 1916. Father William Briggs retired dealer mother deceased some years ago nothing further known. The first thing I noticed was that the certificate had the right name, Sydney, even though the index listed him as Wm. Although the death certificate listed his father as William Briggs, the obituary showed his father was Thomas Briggs. The death certificate showed his mother was deceased some years ago – this is consistent with the fact that he would have been born about the same time she died, which was in 1881. His age of 35 years is also consistent with this. This therefore does appear to be the son of Thomas Briggs and Elizabeth Sharp, and that there was an error on his mother’s death certificate.